As an adult, you have always wanted to improve the health and alignment of your teeth; however, you do not want to deal with the visibility or restrictions of metal braces. To get the results you want, you now have a discreet option using the #1 dentist-recommended clear aligner. With Invisalign in Plano, you can join more than 2.5 million patients around the world who have achieved their dream smiles with the FDA-approved treatment. To make the right choice for your needs, it is time to get the facts about the aligners. Invisalign offers over a 96% satisfaction rate when it is used according to your dentist’s recommendations. On average, you can expect to be completed with your treatment in about one year. During this time, it is best to change to a new aligner weekly. To achieve maximum results, you must be committed to wearing them for at least 22 hours per day. When compared to traditional braces, many have come to find the aligners to be more comfortable and less painful. Using impressions of your mouth, they provide the ideal fit. There will be no difficulty with slipping. They are also smooth. You will not have any irritation to the inside of your lips or cheeks from protruding wires or brackets. You may feel some slight discomfort when switching to a new aligner; however, it will subside within a couple of days. How Often Will I Need to See My Dentist? 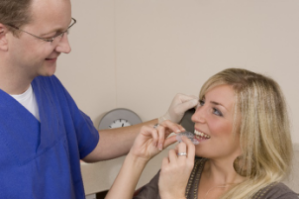 Invisalign and Invisalign Go provide convenient solutions. Since no wires are used to move your teeth, you will not need appointments for adjustments. You will spend less time at your dental office—perfect if you have a busy schedule. You will still need to see your dentist about every 6 weeks. This allows them to monitor the advancement of your treatment. What Happens If I Lose or Break an Aligner? Invisalign aligners are strong, but they can crack or break. If a minor crack appears toward the end of the week, usually it is not a large concern because you will be switching to the next one in the series in just a day or two. If the break appears at the beginning of the week, it is best to call your dentist. In addition, if you lose an aligner, you will need to contact your dentist for a replacement. To protect your new smile, you will briefly require a retainer to prevent your teeth from moving back into their previous positions. If you are ready to get the smile that you have always wanted, it is time to see if Invisalign or Invisalign Go is the right solution for you. After receiving her dental degree in 2000, Dr. Bita Kamali has provided exceptional dental care to the community. In addition to general dentistry, she also offers orthodontics options for adults with Invisalign. If you are interested in the clear aligners, contact Parkway Vista Dental today to schedule your consultation for a straight smile.